And you thought the hardest thing with using a survival kit was unwrapping the Mylar space blanket! Welcome to the world of modular, purpose specific, survival kits. These are essential items that you carry on your person wherever you go. For many this would be a pocket knife, cigarette lighter and a few other small items. However some people can get quite creative and carry enough weapons and equipment to arm a small nation. Similar to Every Day Carry are the Minimalist Survival Kits. These are often packed in a small tin (Altoids mint tins are very popular) and slipped into a pocket so you can carry it with you at all times. Being small and lightweight these kits are limited to a bunch of small items that may help you. Seeing most of us have a full time job, there is a big chance a zombie apocalypse may happen while you are at work. However, turning up at a staff performance appraisal at work with a Rambo style survival knife strapped to your belt may be frowned on by your employer. To get around this some people have a Get Home Bag stored at work. The aim of the Get Home Bag is to help you get from your workplace to home and so contains more practical items than your Every Day Carry or Minimalist Survival Kit have. This could be a change of clothes, practical footwear, a torch, water, a few food bars etc. Along the same lines you can carry a similar survival kit in your car. Or even several different kits. For example you may have a Get Home Bag that you can take with you if you need to abandon the vehicle and walk home. Depending on where you travel you may also have equipment in case you get lost or stuck in a snowstorm. Some basic car essentials like a toolkit, blanket, first aid kit, water and food may all be part of what you carry. 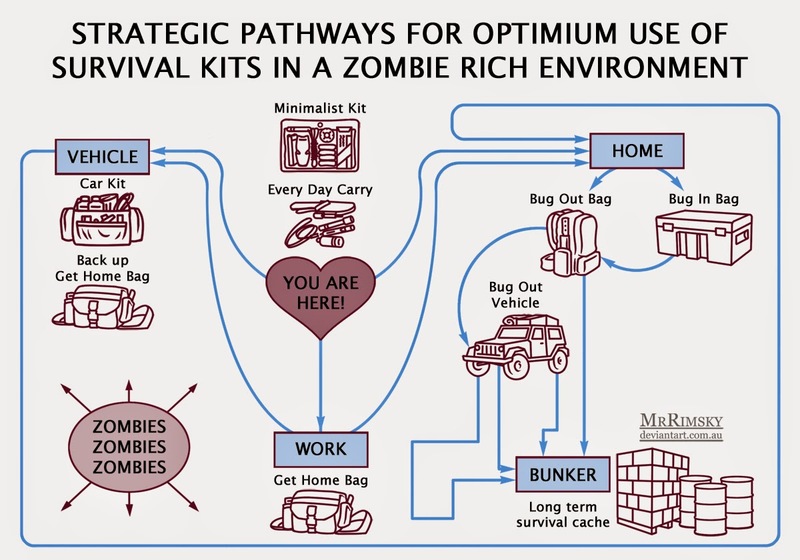 These bags are becoming popular and you can buy ready made bags online, including zombie apocalypse specific bags. The aim of the Bug Out Bag is to contain everything you need to get you through the first three days of a disaster. Hopefully by then help would have arrived. Naturally these bags can get fairly large and heavy so are usually packaged up as a backpack in case you need to leave an area on foot. So a Bug Out Bag is designed in case you need to leave your home in a disaster. What if you decide to hunker down in your home until help arrives? Well you will need, you guessed it, a Bug In Bag. This contains essential items for staying put in your home. As you do not need to physically carry it can be packaged up in a plastic crate or a series of crates. Sure you will also have all the food and gear in your house but the Bug In Bag allows you to get your hands on those emergency chocolate bars quickly. If you are going to flee your home, walking is going to be dangerous and slow. So it is worth having a Bug Out Vehicle to travel in. Naturally you want to customise this vehicle. It could be a four wheel drive with bigger fuel tanks, an electric winch and extra cup holders. Of course it doesn't have to be a car and some creative people use boats, motorbikes, pushbikes, planes and even pack goats. Now if you really want to be prepared you will also want a bunker or safe house set up. This is where you retreat to should you need to flee the zombies. Remote cabins in the mountains seem to be popular, seeing it is based on the idea you want to get away from heavily populated areas. This bunker naturally needs to be fully equipped with food, water and other equipment to sustain you long term. As you can see, buying shares in a company manufacturing survival gear is not a bad investment. Bite off more Mylar than you can chew.